Barbara Edwards Contemporary is pleased to present an historic exhibition of works by renowned American artist Jack Tworkov. One of the most influential artists of the 20th century, Jack Tworkov (1900-1982) was a founding member of the famed New York School. His seminal work of the 1950s and 60s along with artists such as Willem de Kooning, Philip Guston, Franz Kline and Jackson Pollock, helped form the Abstract Expressionist movement. The exhibition includes canvases and works on paper from this period. Tworkov's career, however, did not start or end with Abstract Expressionism. 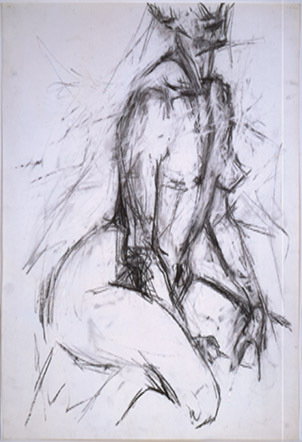 His gestural paintings from the 1950s are perhaps the basis for his work in this field. Tworkov was able to defy stylistic conventions throughout his career in order to create his own unique expression. He was strongly influenced by the singular structures and figurative canvases of cubist painters such as Picasso and Cezanne. As the artist's work became more abstract, his slashing brushstrokes were often associated with surrealism. Born in Poland, Tworkov moved to the United States and studied art at the National Academy of Design and the Art Student League of New York. In 1963, Tworkov was elected Chairman of the Art Department at Yale University School of Art and Architecture. He was awarded a fellowship from the John Simon Guggenheim Foundation in 1970, the Medal for Painting from the Skowehegan School of Painting and Sculpture in 1974, and elected member of the American Academy and Institute of Arts and Letters in 1981. Recent major exhibitions of Jack Tworkov's work have been mounted by ACME Fine Art, Boston in 2008; The UBS Art Gallery (retrospective), New York in 2009 (traveled to Provincetown Art Association and Museum in 2010); Mitchell-Innes & Nash, New York in 2009; and Black Mountain College Museum + Arts Center, North Carolina in 2011. The artist's work is also held in the permanent collections of the Museum of Modern Art, Solomon R. Guggenheim Museum of Art, San Francisco Museum of Modern Art, and The Whitney Museum of American Art.